In order to determine 8th onwards, and seasons total for weight all data from ledger re-entered into an Excel spreadsheet 16th - 19th March 2014. Singles Knockout winner - Ian Russell (from Trophy). Doubles Knockout winners - William Atkinson & Denis Thompson (From New Trophy - AA Spedding Memorial Pairs 1984). Heaviest Fish in a competition - Dave Perrett - 9 lb 08 oz - Wednesday 30th November 1983. Heaviest Fish out of competition - R Goddard - 9 lb 04 oz. Christmas match winner - Denis Thompson - 27 lb 14 oz (from Christmas Match Trophy). Heaviest Bag of Fish - Dave Lyth - 29 lb 13 oz - Sunday 15th January 1984. 1st - G Thompson - 7 lb 08 oz. Total weight for the season - 1,654 lb 10 oz. * New WSAA Season Record - William Atkinson, 197 lb 11 oz. 23rd October 1983 - Andy Marr (Snr) 1 fish of 6 lb 00 oz. 2nd November 1983 - William Atkinson 1 fish of 6 lb 05 oz. 16th November 1983 - Dave Lythe 1 fish of 6 lb 13 oz. 20th November 1983 - Dave Perrett 1 fish of 7 lb 08 oz. 27th November 1983 - WSAA Open Match, 10 members weighed in. Tuesday 22nd November 1983 - Dave Lythe 1 fish 7 lb 13½ oz - out of match. Sunday 27th November 1983 - Denis Thompson winner of WSAA Open - 13 lb 14 oz. 30th November 1983 - Dave Perrett 1 fish of 9 lb 08 oz part of a 20 lb 03 oz bag. Ian Russell 20 lb 02 oz bag. Sunday 11th December 1983 - Paul Kilpatrick bag of 28 lb 04 oz. 15th January 1984 - Dave Lythe bag of fish 29 lb 13 oz. 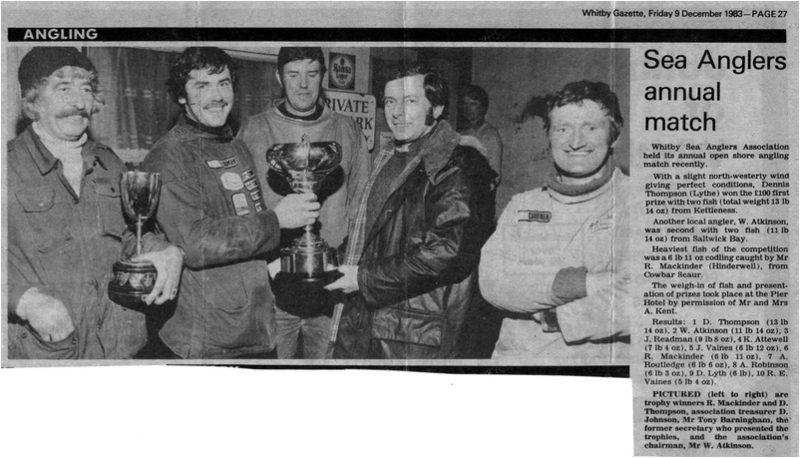 22nd January 1984 Bell Trophy. 28th March 1984 - William Atkinson 1 fish of 9 lb 04 oz. Note:- matches are not always every Wednesday & Sunday. Sunday matches are quiet often Day Matches, with alternate Heaviest Fish & Heaviest Bag themes. Christmas Match was fished at night. Leader board at end of October after 9 of 47 matches. Whitby Sea Anglers Association held its annual open shore angling match recently. With a slight north-westerly wind giving perfect conditions, Denis Thompson (Lythe) won the £100 first prize with two fish (total weight 13 lb 14 oz) from Kettleness. Another local angler, William Atkinson, was second with two fish (11 lb 14 oz) from Saltwick bay. Heaviest fish of the competition was a 6 lb 11 oz codling caught by Mr. Ray Mackinder (Hinderwell), from Cowbar scaur. The weigh-in and presentation of prizes took place at the Pier Hotel by permission of Mr and Mrs A. Kent. PICTURED (left to right) are trophy winners Ray Mackinder and Denis Thompson, association treasurer Dave Johnson, Mr Tony Barningham, the former secretary who presented the trophies, and the association's chairman, Mr William Atkinson. WSAA Open - no record of numbers of members who fished, just weights of those who caught fish. Leader board at end of November after 18 of 47 matches. 21 members took part, 14 weighed in 185 lb 02 oz. No mention of Heaviest Fish. 185 lb 02 oz - Total weigh in. Leader board at end of December after 24 of 47 matches. Leader board at the end of January. Leader board at the end of February. Leader board at the end of March after 47 matches. Whitby Sea Anglers Association held its annual dinner and prize-giving at the Angel Hotel, Whitby, on Friday, with 43 members and guests attending. The chairman, Mr W Atkinson, said it had been a good winter's fishing with plenty of codling in the five-pound range up to the end of January. The total catch was just under the record of 1,770 lb. 86 lb 06 oz to 67 lb. 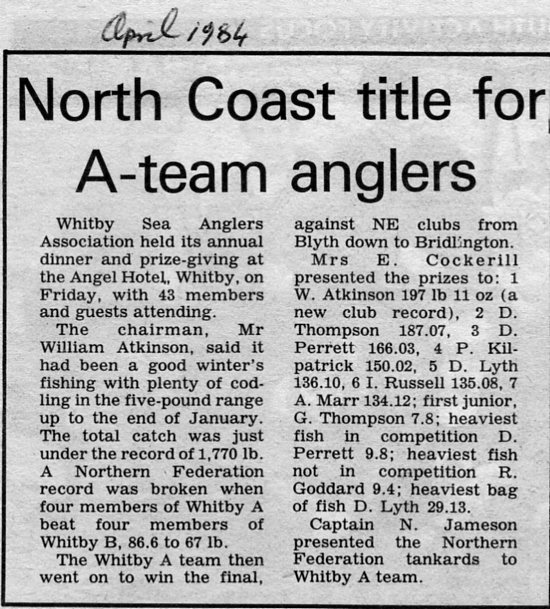 The Whitby A team then went on to win the final, against NE clubs from Blyth down to Bridlington. 7 - A Marr - 134 lb 12 oz. Heaviest bag of fish D Lyth - 29 lb 13 oz. Captain N Jameson presented the Northern Federation tankards to Whitby A team. Last edit 16th March 2014, 18th March 2014, 19th March 2014.